Qbert. Dieser Mann hat es nicht nötig vorgestellt zu werden. Er ist einer der größten Turntablists der jemals gelebt hat, ist dreifacher DMC World Champion, hat mehr Scratches erfunden als die meisten überhaupt auflisten können und so leicht reicht ihm an den Plattentellern keiner das Wasser. In 2014 veröffentlichte er zwei Alben. Wir hatten die Chance mit Ihm genau darüber und über das Leben an sich zu sprechen. DEAD: First off I would like to thank you for doing this. I have been an admirer of you since I first heard you on Dr Octagon’s ’Dr Octagonecologyst’. I am sure there is not a single one of DEAD Magazine’s readers that have not heard of you, but just to be certain, would you please give us a short introduction of yourself? DJ QBert: I’m just a musician that loves to skratch and create things with my company, Thud Rumble, that I think are interesting. DEAD: You are not really known for releasing that many records, apart from battle tools. Last year however, you not only released one full-length album, but two, ’Extraterrestria’ and ’GalaXXian’. Would you mind telling us a little bit about the idea behind them and how they came in existence? One album (Extraterrestria) is music from outer space and it’s all instrumental music from other worlds… The idea is an ongoing encyclopedia of music not from Earth. The other album (GalaXXXIan) is a reflection of Earth at this time with rappers. 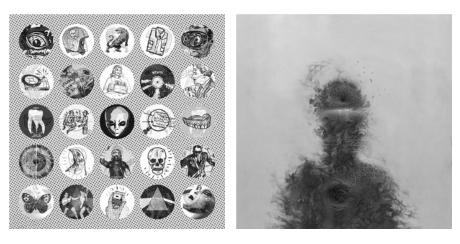 Both albums feature different experiments in skratching ideas. DEAD: What kind of response have you got so far for the albums? DJ QBert: Great so far! Recently, we just started sending out the vinyl version of the album and people have been posting pics on Instagram and commenting on the great job our team (along with Morning Breath Inc. and Novalia) did in creating the world’s first interactive midi controlled album cover. DEAD: How would you describe your music and would you mind sharing your creative process with us? Do not hesitate to get geeky for the readers out there. DJ QBert: I’m into texture and beats that are on the organic analog side. And I also have another side of me that loves the futuristic digital side of production as well. Most of my tracks are usually various ideas that take skratching in different directions. At least, that’s what I think I’m doing. In life, I’m a peaceful spiritual person, but for some reason, much of my music tends to be on the more sinister, grimy or mysterious vibe. But I also love funky stuff and usually whatever sounds bizarre and strange. But always having the drums either interesting like old b-boy breaks or bangin’ with distorted 808 drums or both. When I get an idea, I’ll try to see the song in my head as if I was scoring a scene in a movie. On the last album, I used a different drum machine on each track, just to make each track as unique as possible. Some tracks were completely all from turntables too. DEAD: How do you look at turntablism today? Even though DJs seem to be bigger than ever, in some cases bigger than some of the most popular bands out there, turntablism seems to be fading out a bit at moment. What are your thoughts concerning that, the well-being of turntablism and its future? Turntablism is a beautiful art that is not dying out from where I see it. 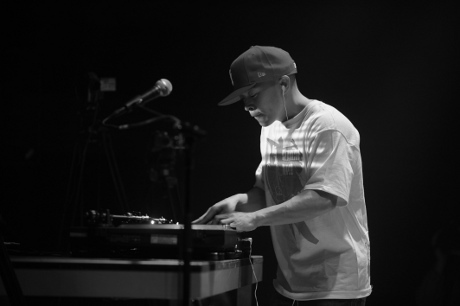 DJ QBert: Turntablism is a beautiful art that is not dying out from where I see it. It’s just gone underground, and for me it’s always been underground. Same with good music, you have to know where to look. Of course you won’t hear it on the radio, but you also won’t see the greatest break dancers on TV either. It’s definitely not a commercial thing and it does go way over lots of heads because of its complexity. DEAD: What is your opinion about Serato etc.? Do you think that it has somewhat destroyed the DJ-culture? When you do not have to worry about changing records and where you can make a lot of it in advance instead of in the moment. For example you do not have to worry about the needle drop or that the needle will skip. DJ QBert: I think it’s great that you don’t need to carry all those crates of records. It only destroys the culture if the DJs don’t know what to do with the new tools. If there is a creative DJ, then they will know how to flip the new technology and create amazing new things. This question always makes me think of an old school chef that complains about how ovens nowadays are too automatic and that in the good old days they would have to rub sticks together to make fire. DEAD: For quite a few years now you have been involved in something called Qbert Skratch University. Can you tell us a bit more about that? DJ QBert: It’s pretty much where we all nerd out and help each other to make new skratching techniques and teach new cats all the way from square one to get to be their best and beyond. I teach everything I know in there, but I’m definitely still a student with all the crazy things that go on in there! There are all kinds of video classes for each skratch and much more, and what I also love is all the amazing beats that the students post up! There are all kinds of different subjects and classes on the art, theory and philosophy. DJs even send in vids of their new things and I even reply to them with a video if they have a question and I do my best to take them to their next level. DEAD: Can you tell us about your inspirations and influences, music wise? DJ QBert: Nature and life in general is my teacher. But as for as artists, I really have my ear open to listen to all kinds of masters. I’m all about asking other musicians, who they think were the best in their fields. Lots of jazz musicians, rock guitar heroes, painters, MCs etc. Anyone who was amazing in their craft, always spark the lights in my mind when I do research on how these geniuses think. DEAD: Many DJs out there are avid record collectors? Is that true when it comes to you too, and if so, what are some of your recent favourites that you have picked up? DJ QBert: Too many to name. Get the “Breaktionary” set and you’ll hear my favorite things. Or listen to my old mix “Demolition Pumpkin Squeeze Muzik”. These are collections of breaks that I’ll always love! DEAD: What are you up to when you’re not making music? DJ QBert: Bike riding, swimming, speed blitz chess, studying about the mysteries of life. I listen to Coast to Coast AM every day as I’m working out. There are also all these Disclosure videos on YouTube about futuristic technology that’s still to come. DEAD: For someone who has accomplished more than most in his artistic field, what are your hopes and dreams for the future? DJ QBert: Just working to get better every day. Always thinking of different things to make the world a better place. It’s my passion. DEAD: Any final words of wisdom from the Grandmaster? DJ QBert: Just keep spreading the love and helping others because when you help someone, you are really helping yourself on another level. DEAD: Thank you for your time and the interview. DJ QBert: Peace n Blessings.